SuperheroYou | New Site Coming Soon! Your Online Headquarters for Practical & Powerful Advice on Brain Health, Mental Power and Optimal Learning. 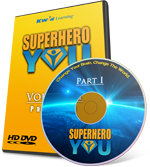 This site is for active and lifelong learners who want to unleash more of their brain's incredible ability to to learn, think, remember, create and innovate faster than a speeding bullet, more powerful than a locomotive, able to leap ...well you get the idea! We give aspiring heroes the mental and lifestyle tools they need to make their lives better through in-depth reporting on everything from brain health to practical memory improvement as well as cutting-edge brain technologies and the very latest in human potential research and innovation. SuperheroYou was created for people who crave real usable advice to keep up with their increasingly demanding and exciting lives. We've assembled a literal go-to faculty of experts and geniuses to arm you with the tools to upgrade your brain, learn anything faster, unleash your mind-power, live a better life, and have more fun doing it. Watch clips, see pictures and join the conversation on Facebook & Twitter. © 2012 SuperheroYou, LLC, All Rights Reserved.